Samsung virtual reality headset might beat Oculus Rift, Sony Morpheus to market. Samsung is reportedly scrambling to launch its own version of the Oculus Rift virtual-reality headset, shown above. Congratulations to Facebook and Oculus VR, whose Oculus Rift virtual-reality headset is reportedly set to receive the consumer-electronics industry’s highest honor: getting ripped off by Samsung. The South Korean conglomerate plans to launch its own virtual-reality gaming headset later this year, Engadget and Business Insider reported Thursday. The former speculates that the device will connect to your Samsung phone or tablet to display Android-powered games in VR form. If true, the news would cement VR headsets as the trendiest tech toy of the moment. The honor isn’t entirely unexpected: Oculus’s device had already spawned a Sony knockoff, a slightly lesser laurel that nonetheless is considered a strong leading indicator of trendiness. If getting copied by Samsung is like winning an Oscar, a Sony clone is like a Golden Globe. 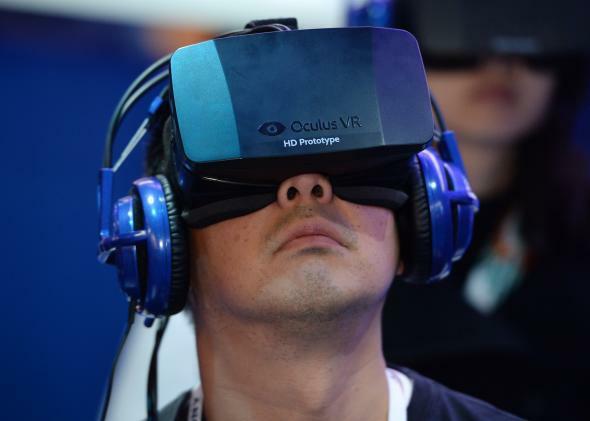 Still, virtual reality shouldn’t get too comfortable at the top of the tech heap. After all, it was just a few months ago that everyone was talking about Samsung copying Google Glass, a product that some have deemed a failure before it has even officially launched. And remember, as prestigious as it is to have your product reverse-engineered by the folks back in Seoul, it isn’t always a boon for business. Sure, Apple’s iPhone and iPad are holding their own against Samsung’s lookalikes. But Apple wouldn’t keep dragging the company to court if it didn’t think the competition was taking a bite out of its bottom line. Meanwhile, Samsung is getting so fast at fast-following that it’s starting to release its imitation devices even before the originals hit the consumer market. Its Galaxy Gear smart watch, for instance, was initially seen as a response to Apple’s rumored iWatch—but it’s now been available for months, and the iWatch has yet to materialize. Then again, maybe that’s because Apple’s waiting to see if it can make a smart watch that‘s actually useful before it releases anything to the public. Still, Samsung’s entry into the VR game might serve as some extra motivation for Mark Zuckerberg and company to ship an Oculus product earlier than they had planned. According to Engadget’s Ben Gilbert, Samsung is bent on announcing its headset by year’s end and beating both Facebook and Sony to market.